Little Shop of Horrors" could fit into any number of genres - sci-fi, horror, comedy, musical - but for actors, especially young ones, the song-and-dance aspect would seem to be the most daunting. But judging by the ease with which the Berkeley Playhouse Teen Company performed the show, you'd think anyone could do it. The opening number, an ensemble song called "Skid Row (Downtown)," made it immediately apparent that these actors were more talented than their years. The subsequent story is pleasantly strange, simple and thoroughly time-tested, having been performed countless times since its 1982 off-Broadway debut. 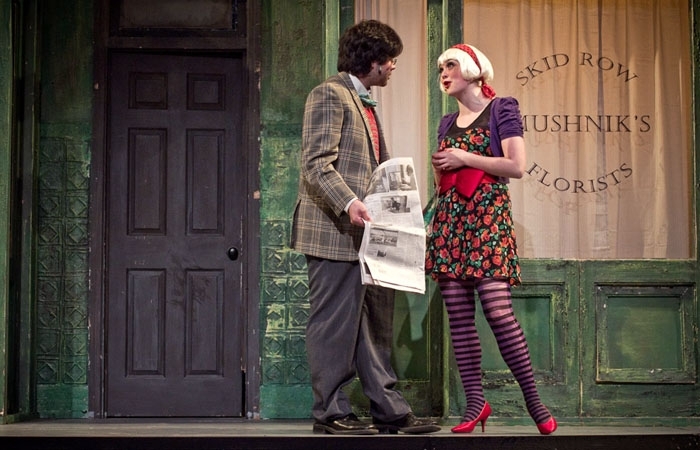 Meek Seymour (Aidan Elsesser) and his pretty, unknowing crush Audrey (Emily Morris) work in a Skid Row flower shop for the crusty Mr. Mushnik (Miguel Gamalinda). With the store deeply in the red, Seymour makes a last-ditch attempt to promote the shop and bring in some new customers. He unveils Audrey II, a strange Venus flytrap-type plant he discovered during a solar eclipse. The plant quickly draws the attention of customers and local media, giving the store and its employees a new lease on life. Only problem is, as Seymour and audience discover together, the plant needs human flesh to live. Kyle Choate and Julia Marlin, in portraying Audrey II, displayed impressive coordination, complicated by the cumbersome costumes and the pretense of being a single plant. Their rollicking musical number, "Feed Me (Git It)," reveals the extent of Audrey II's manipulation, as the plant urges Seymour to prolong his good fortune at the expense of new victims. One of these victims, unfortunately for the audience, is Audrey's abusive boyfriend Orin, a maniacal singing dentist. Nicholas Frangenberg made the most of his role, commanding the stage with his convincing physicality and powerful voice. In the wake of Orin's consumption, the question becomes, how far will Seymour go to nurture his growing fame and burgeoning romance with Audrey? By the time this question was answered, the Julia Morgan Center (JMC) audience had experienced a varied display of some of the Bay Area's best young acting talent. Emily Morris was a particular highlight, managing the impressive feat of singing well while maintaining her comically ditzy accent. The Teen Company cast was composed entirely of local high school students, lending a rare local feel to the show. The accessibility of the cast and leadership, including director Marissa Wolf, was a marked and welcome changed from bigger theaters. While she has directed adult casts, Marissa feels that teenagers bring something different to the table. "What the teenagers bring is a hunger, to work and to learn, to be treated as professionals," she said during an interview. Stopping by the JMC to talk with the actors after rehearsal, I got an even better feel for the young actors' passion. While my impromptu interview with three of them was brief, their excited interplay and eagerness to talk about the play indicated that the rigorous six-week rehearsal had been a labor of love, plus a lot of fun. More than just enjoying a fabulously entertaining performance (which contained none of those stereotypically wince-worthy community theater moments), audience members at last weekend's shows entered a world where teenagers perform like adults, while maintaining the exuberance of children. This is the kind of performance the community could use more of. Pay homage to Nick's youthful exuberance at [email protected]rg.